1918 was an incredibly complex time geopolitically for the European continent. The collapse of the German, Russian and Austro-Hungarian Empires had left power vacuums and a number of states sprang from their husks. Some of these states were short-lived, while others (the Baltic countries included) enjoyed a good few decades of independence before finding their circumstances considerably diminished. The First World War was as catastrophic for Latvia as it was for Belgium, the country most famous for its total devastation at the hands of the Axis powers. Both regions were destroyed economically by the frontlines dissecting their lands. The factories of Latvia, for example, famed for producing the first cars of the Russian empire (made by the Russo-Balt company), among many other industrial goods, were shipped east in expectation of the German advance. Meanwhile, the populations of the border zones were also evacuated. Over 500,000 Latvians found themselves in Russia proper, and the countryside, already under strain from war and increased demand for food, became fallow and underexploited. Thanks to its early occupation by the Germans in May 1915, the city of Liepāja was spared the deindustrialisation of the rest of Latvia. Because of its location far behind the front lines, it remained relatively safe throughout the war, with its infrastructure intact, despite the war conditions in place due to the military occupation of the city. Liepāja (then officially known by its German name, Libau) even issued its own currency, the Libau Ruble (Либавское городское самоуправление рубль). On 9th November 1918, following a revolution, a republic was declared in Germany, and two days later, an armistice was signed in Compiegne, France, ending the Great War. On the day between, however, 10th November 1918, according to some sources, a precursor to the declaration of the Latvian republic took place. Liepāja declared itself an ‘independent Latvian republic’. This Republic of Liepāja never became a major force, and was incorporated into the Latvian state de facto on 7th January 1919 when the Latvian provisional government made the city its headquarters. They did, however, send several dozen railway cars full of flour to the provisional government in Riga as an act of solidarity and support. Meanwhile, on 2nd December 1918, a British naval squadron docked in Liepāja. This force proved an invaluable help to the Latvian state. However, due to the volatility of and expected advance of the Bolsheviks in the region, the western allies asked the German occupying forces to remain in Latvia for the foreseeable future. From 7th January-8th July, a period of six months, the Latvian government was based in Liepāja. After Riga was taken by the Bolshevik forces, they found their position in the heart of the country untenable. With the exception of a period between 16th April and 28th June they were located in a now non-existent building, at 6 Lielā Street. That period, from April-June, is when this already confusing situation becomes even more complicated. On 16th April 1919, in reaction to the murder of three soldiers of the Landeswehr (the German forces based in Latvia), the building on Lielā Street and the headquarters of the Latvian army in the war port district were attacked and taken over by the Germans. Simultaneously, the Latvian Prime Minister, Kārlis Ulmanis, sought sanctuary, initially with the British mission at 10 Vites Street. He later moved to an infamous vessel, Saratov, on the Commercial Canal, which was flanked on either side by British naval units. For a brief period, this vessel was the only place in Latvia controlled by the Latvian government, the rest of the country being controlled either by the Germans or the Red Army. Despite nominally supporting the provisional government of Ulmanis, General von der Goltz, head of German forces in Latvia, later went on to support the puppet government led by Andrievs Niedra which was declared on the 10th May 1919. This alternate Latvian government, however, proved remarkably short-lived due to the failure of the Baltic German army to defeat the joint Estonian-Latvian force in the Battle of Cēsis on 23rd June 1919. From that point onwards the power of the Germans in Liepāja was diminished. On the 25th June 1919, the German Victory Monument at the end of Kūrmajas Prospekts (the main road leading to the sea) was torn down and replaced with a Latvian flag. 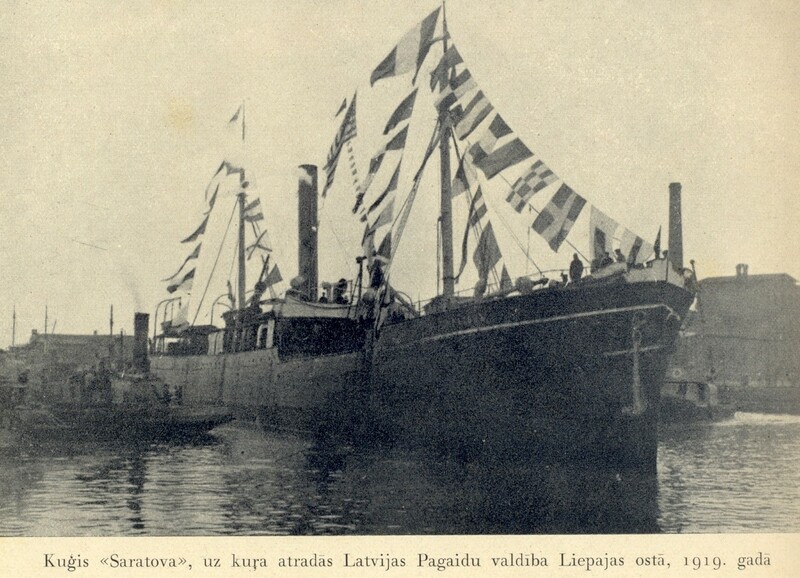 Only two days later, on the 27th June, Liepāja was safe enough for Ulmanis to disembark his vessel, and on 7th July the Saratov and the provisional government left Liepāja over the mine-laden Baltic sea to return to Riga, the capital. In an ideal world, the story would have ended here. But sadly, Latvian history doesn’t follow any Hollywood-style formulas, and in November, the German forces were back, this time under the leadership of Pavel Bermondt-Avalov, whose last stand was against the Latvians in Karosta, with an attack on the canals and forts surrounding that district of the city. The attacks were repulsed with the help of British artillery, and from that point onwards the west of the country was secured for the Republic of Latvia. Nowadays, the majority of the locations associated with the events of 1919 in Liepāja have vanished. The Saratov was returned to the USSR after the Latvian-Soviet peace treaty in 1923 and scrapped in the 1930s. The buildings on Lielā street was destroyed during the Second World War. The wooden house on Vites Street which housed the British mission still stands, however, as do a couple of places connected to Liepāja’s status during those six months. The Monument to the Fallen Soldiers of the War of Liberation stands in the Northern Cemetery in the Northern Suburb between military cemeteries for the Germans and Russians lost in WWI on Oskara Kalpaka Street. Ninety-one soldiers are buried there. A fairly underwhelming monument stands by the canal next to the location where the Saratov was originally docked in 1919. The place where Ulmanis lived in 1919 on Toma Street now has a plaque in commemoration of this period. Meanwhile, certain street names pertain to the dates and actors in this period. Britu flotes iela (British Fleet Street) in Karosta was no doubt named in gratitude for the defense of the government in Liepāja. The 14. Novembra Bulvāris (14th November Boulevard) runs all the way from Brīvības iela along the defensive canals and forts to Viestura iela, almost to the Baltic Sea. This part of the world thankfully seems a much more stable place than in 1919. However, it should also serve to remind how fragile peace and independence can be. Reading materials from the 1930s, it seems clear that at the time this was viewed as the biggest challenge ever faced by the Latvian state. Now, the story of the deportations, barricades and coups in Moscow, gunfire in Riga in 1990-91 have entered family lore and hold a much more relevant place in the memories of the Latvian people. It also shows that a little help can go a very long way. Although the British presence in Latvia and Estonia in 1918-1919 rarely extended beyond the range of naval artillery, and the small arms distributed to the armed forces of these nascent states, their support made the independence of those two countries a reality. Finally, the role of Liepāja as a two-time cradle of independence (in both 1918 and the 1980s) is well worth remembering. Liepāja can sometimes feel like a sleepy seaside town, but I feel it deserves this after the action-packed last century it experienced!